Hyunda’s Genesis luxury sub-brand has only recently been announced, but it already looks as though the first car with that nameplate, the EQ900, is going to be a real success. Hyundai started taking pre-orders for the new luxury sedan last week, and it received 4,342 orders on the opening day. What makes this all the more astonishing is that very few real details about the new car have been revealed. To put things in perspective, the Hyundai Equus, which is the forerunner of the EQ900, received 1,180 pre-orders when it was initially released back in the early part of 2009. The number for the new vehicle is also better than what the Genesis sedan accomplished back in 2013, when it received 3,331 orders on its first day. A spokesperson for Hyundai Motor Company in Korea said that the company is pleasantly surprised at the number, especially since the vehicle in question is a high-end luxury sedan. 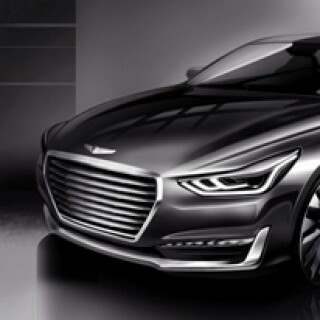 He believes that the strong performance of the Genesis, which will be renamed the G80 under the new brand, has helped raise the public perception of the Hyundai brand. It also helps to have great technology and safety features available, as well as a strong marketing campaign. Another promising sign is that a large number of the pre-orders were made by individuals, with history showing that the earlier orders are quite often made at the corporate level. Of the vehicles pre-ordered, roughly 60% were made by individuals, which Hyundai sees as a sure sign that their marketing efforts are paying off. Hyundai believes that it will be younger buyers that will be attracted to the EQ900, but that it will take some time to see which group takes to the vehicle. In the case of the Equus, it was the 50-plus crowd that proved to be the largest buying group, but Hyundai has hopes that people in their 40’s are who will be attracted to the EQ900. There will be 3 versions of the EQ900 made available, with the 3.3, 3.8 Turbo, and 5.0-liter all offering features aimed at wealthier car buyers. One great example of the features available in the EQ900 is a driver’s seat that offers up the best position available to the driver after they have inputted specific details such as body type and weight. The vehicle will also feature sound insulation glass that will allow for an incredibly quiet ride. The upcoming Hyundai Genesis EQ900 will also feature an autonomous driving system that will automatically keep a safe distance between the vehicle itself and the vehicles in front of it.